Extracurricular Activities : Dance, Music and Sports: Kho-Kho, Kabaddi. Taking part in regional level competition. The School is located about 110 km away from Rishikesh along a branch road of the Deoprayag - Shrinagar Road, at a distance of 30 kilometres from Deoprayag. As soon as you take this branch road, you enter into a picturesque Hill area of Tehri Garhwal District. Sauru is situated near the famous ancient holy Temple of Goddess Maya-Devi. The School is named after this Goddess who is highly worshipped in this region. Pilgrims from distant places regularly visit the Temple to get blessings from the Devi. 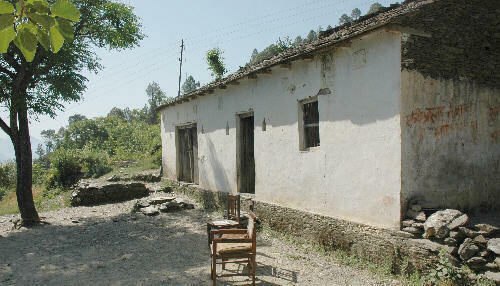 The School was established in this tiny village in 1998 in order to provide good education to the village children. The School is now running smoothly and gained reputation for its standard teaching and quality of the students' performance. The children come from 3 km to the School. The School gives equal importance to develop sports and cultural talent of its students.